Well, yes, from the bird’s perspective, I suppose it might be “wrong with the chicken” to be dead in our freezer until such time as I see fit to turn it into pot pie innards. Weird that a woman who doesn’t even like puppies would take the dead chicken’s side in this, but I didn’t have time to dwell on it, what with all the clean socks to wear and bourbon to drink. “Yeah, I know it’s kind of dodgy to stock up on buy-one-get-two-free meat, but chicken doesn’t grow on trees, or maybe it does, but regardless, its thighs usually grow up to cost three times what I just paid, so let’s think happy thoughts and drink Old Crow. Darling,” said I, in the name of peace and reason and finally getting down to the drinking part of a Friday night that had been in full dark swing for two hours already. “But I was going to get you bourbon for Valentine’s Day,” she said. Isn’t that thoughtful? Well, except for the outrageous implication that the bottle I brought home on Friday automatically precluded her from bringing more home on Monday. I am very lucky that the young lady does a lot more drinking than she does judging, but I still run into the occasional teaching moment wherein I must explain that the earth wouldn’t stop spinning if a person came into simultaneous possession of two bottles of bourbon. if left to my own devices, I’d just stick with whiskey on every liquor-drinking day. I fear I’ve been misleading you fine people for the past couple months with all my talk of tequila and rum and weird dairy products that get mailed to me in test tubes. I like all that stuff, but if left to my own devices, I’d just stick with whiskey on every liquor-drinking day. The only whiskey I don’t like is Jack Daniel’s, which we’ll address somewhere down the line when this column devolves into Sobbing Uncontrollably as You Smash Everything on the Bottom Shelf. Other than Jack, I love it all to such an extent that I even have a theme song, just like any other pro wrestler or delusional narcissist might. I used to drink Eagle Rare, but that was back in the golden days of yore when I had disposable income and a blissful ignorance of fluctuations in the chicken parts market. Our household has to limp through another couple lean months until my research assistant graduates into the lucrative world of whatever it is she’s studying, and at $12 a fifth, Old Crow is the sturdiest support I’ve found. 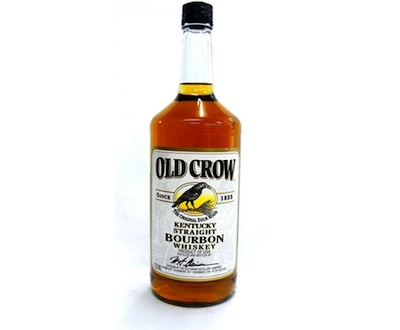 Old Crow smells like candy corn and sweet orange tea, and it tastes like buttered toast. This entry was posted in Cocktails, Culture, Drink of the Week and tagged best bargain whiskey, Bottom Shelf Whiskey, fly fishing and whiskey, Old Crow whiskey. Bookmark the permalink. When times were tough, I went on a mission to find the cheapest best tasting whisky. My “research” indicates that Evan Williams green label is hard to beat. It’s a little cheaper than the Crow and satisfies my taste buds, even when drinking straight. Although, I certainly wouldn’t say no to a glass of OC. I have seen you drop to the level of OC and not complain a bit. However, I do back your EV choice. But you have to admit, the name doesn’t ring quite like Old Crow. Brethren! I’ve stooped pretty low, too.